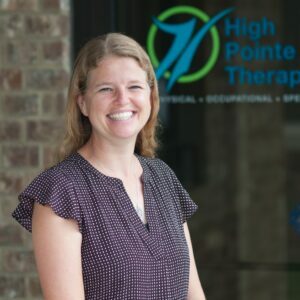 Speech Language Pathologist ~ Allison joined the High Pointe Therapy team in April of 2018. She earned her Masters Degree from Eastern Michigan University and graduated in 2007. She is originally from Michigan and has been married to her husband for 11 years. They have 3 children Caroline, Leah, and Sydney who keep them very busy. When not at High Pointe, Allison home schools her 3 kiddos and enjoys it very much. Allison is passionate about speech therapy because she doesn’t think it was fair to watch a child not be able to communicate with their parent.